... or Electrical Engineering, a Government Certificate of Competency (Factories) and 5 - 10 years' experience in a manufacturing environment. ... stability and service delivery of SAP Production Systems and maintaining good governance. There are 175 Government job vacancies in KwaZulu-Natal available immediately, compared to 126 in eThekwini. The standard deviation of salaries for the results of this search is 655,941. The Adzuna recency index score for this search is 1.85, suggesting that demand for Government job vacancies in KwaZulu-Natal is increasing. 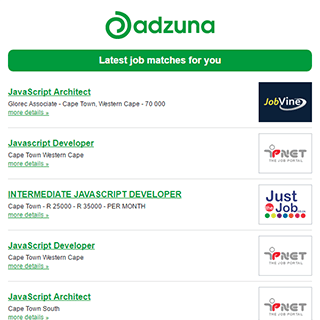 Companies presently offering Government job vacancies in KwaZulu-Natal include Nedbank, Dis Chem Pharmacies, AVI..
Get the latest Government Jobs in KwaZulu-Natal delivered straight to your inbox!